Russian oil giant Yukos has denied a report that the authorities are pursuing it for $5bn in unpaid taxes. Russia's Interfax news agency reported that the Tax Ministry had informed state prosecutors that Yukos owed $5bn in back taxes. "We consider the claim of 150 billion roubles ($5bn) of tax arrears absolutely improper," a Yukos spokesman said. The Tax Ministry and the Prosecutor General's office declined to comment. A tax dispute would pile further pressure on Yukos, which has come under intense official scrutiny in recent weeks. Last month, former Yukos chief executive Mikhail Khodorkovsky - believed to be Russia's richest man - was arrested on charges of tax evasion and fraud. His arrest was seen as a warning to Russia's super-rich business leaders to stay out of politics. 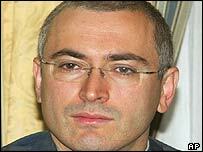 Mr Khodorkovsky had backed several political parties. The authorities' behaviour has attracted high-level criticism. "What really worries me is the way the prosecutors of this have behaved towards Mr Khodorkovsky," former Soviet leader Mikhail Gorbachev told BBC World Business Report. "Mr Khodorkovsky was not really the only target. "They did it in such a way as to intimidate the business community and to intimidate our society, and that is something I cannot approve of," Mr Gorbachev said. Last week, Yukos was dealt a further blow when its merger partner Sibneft announced that it was temporarily pulling out of their $11bn tie-up at the last minute. The move has been widely interpreted as an attempt by Sibneft shareholders - including Roman Abramovich, owner of Chelsea Football Club - to force their counterparts at Yukos to surrender control of the combined company. Analysts said Sibneft's move may have been motivated in part by a suspicion that Yukos' troubles with state regulators were not yet over. "It's hard to fault them for not wanting to renegotiate," said Paul Collinson at UBS Brunswick in Moscow. Talks between Yukos and Sibneft shareholders are continuing. Yukos shares closed unchanged on Tuesday at $11, while Sibneft shares rose 1.4% to $2.50. "I don't think it should be a secret trial." Russia's richest man has fallen foul of the Kremlin and politics.